Electrically welded side seam, with ends double or triple seamed and solutioned.  Pressed out rolling hoops in body (W section hoops available). Electrically welded side seam, with ends double or triple seamed and solutioned. Pressed out rolling hoops in body (W section hoops available). The tight head drum is a convenient container for transporting liquids. We manufacture them to British Standards and meet the performance requirements of UN Groups I, II or III. 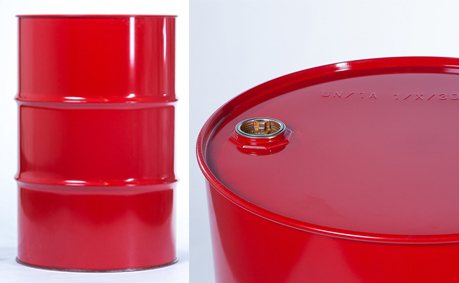 The standard size is 210 litres (often referred to as barrels), but we can supply large tight head drums of different capacities ranging from 180 to 225 litres. We also manufacture intermediate size tight head drums in a range of diameters and heights that provide a capacity of 50 to 173 litres. These are also available with reduced bottoms that make interstacking possible.